Spring High School's Navy JROTC cadets continue to prove why they are some of the best after competing and earning first place overall in the Caney Creek Top Gun: Dog Fight Military Skills Meet on March 23. "This was a fun meet for our cadets," said retired U.S. Navy Capt. James Boyer, who is also the unit's lead instructor. "They were able to exercise everything that they have learned over the last year. This is one of the meets where our cadets come together and have fun." "Sometimes you're crawling on your stomach or running," Boyer said. "And sometimes, you're carrying a practice dummy, similarly to a firefighter carrying a person out of a building, and that could be up to 160 pounds. It's a pretty difficult thing, and you have to be in shape or have a good physical condition." Spring High School's Lion Regiment continues to perform well on many levels. 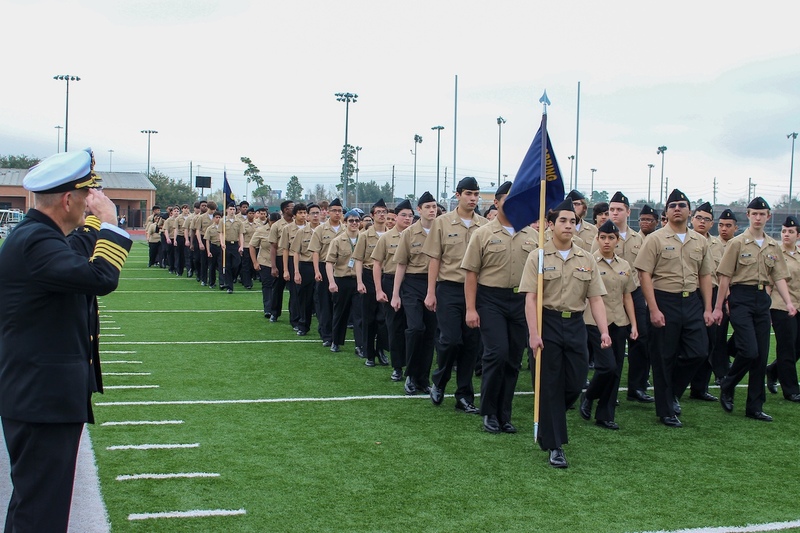 Back on Feb. 5, a total of 531 students in the Navy JROTC unit participated in their annual inspection for accreditation. "The [inspection] events are mandated by the Navy and is a once-a-year inspection where we are supposed to have maximum participation," said Boyer. "It's an opportunity for our cadets to showcase themselves." The annual inspection is an important part of the unit's accreditation and helps ensure continued federal funding to support program needs and activities. Cadets also use the event to show off their skills and demonstrate some of what they've learned as members of the regiment through marching exercises on the school's field, as well as armed and unarmed drill team performances. "For the annual military inspection, we're really looking at how effectively the unit is able to reach those leadership development goals," said inspector and U.S. Navy Capt. Timothy Symons. "We're getting a general assessment of the uniform inspection, and it's pretty easy to see if they're following uniform standards. As a part of that, we also ask general military knowledge questions, so we're looking for things we would know. We're really looking for general impressions." The event included a range of day-long activities, including cadet briefs, a series of formal presentations given by the regiment's student leaders to provide inspectors an overview of unit operations, recent unit milestones, obstacles overcome and ongoing items of importance. In addition, cadet leaders shared personal accomplishments, as well as their future goals, and higher education and career plans. "This is a leadership development program unique to any other high school program and that these kids are actually running it," said inspector and retired Navy Cmdr. Jerry Coufal. "It's a pretty neat inspection where the kids actually get to showcase what they've learned and prove that they're really doing it." "She wants to be a doctor in the Navy," said Pemberton, whose father also served. "She really looks forward to the JROTC competitions. She'll wake up at two in the morning to shine her shoes and make sure she has everything ready. She makes me very proud." "I'm expecting somewhere between 40 and 50 percent of our freshmen will stay with us and come back next year," said Boyer. "And if they do, well, we're going to grow considerably."